Posted by Dustin Miller on January 28, 2013. If you have any experience with Google AdWords, you’re at least loosely familiar with negative keywords. 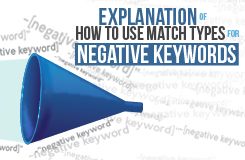 Negative match types are arguably the least understood of all the keyword match types, but are one of the most valuable tools you can use to optimize your AdWords campaigns. The basic function of a negative match is to keep Google from triggering your ads with the search terms you specify. Sounds simple enough, right? Well, it can be much more complicated and involved than you may think. For example, if you’re running a campaign for teddy bears, you’ll want to add other types of bears to a negative list (e.g. polar bears). This is a general negative list you want to apply to all campaigns. Stay tuned for tips on building a general negative list in our next blog. Our focus today is how to build an exact match negative list. After you build out your Google AdWords campaign into exact, phrase, broad match and broad match modifier, it’s time to refine your targeting one step further. Building an exact match negative list ensures that Google will only fire ads in your exact ad groups for the terms you specify when applied to your other match type ad groups. Your most valuable, high-volume keywords should only be firing ads in your exact match ad groups. With that, you’ll want to weed out all of the low-volume keywords from your exact match ad groups prior to building your negative list (these are good for phrase and broad match modifier). If you’ve managed PPC accounts for high-volume clients, you may know that there is a limit on how many negative keywords you can add to a list. Having hit the limit many times, we know it’s 10,000. We also know a creative way around that limit. To create a negative list, you use your shared library. We create another shared library, export all the keywords from the exact ad groups, use a keyword wrapper to cover different match types and import the list into AdWords through AdWords Editor. Once you apply your exact match negative keyword list to your phrase, broad, broad match and broad match modifier ad groups, sit back and watch the overall performance of your campaign greatly improve. Have any insider AdWords tips you’d like to share? Let us know in the comments below, and stay tuned for more tips on building negative keyword lists and other great tips from PPC Professionals!